Bonnie Scotsman is a patchwork quilt block pattern that has been called other names throughout the years, so don't be surprised if you see the design labeled differently. The block's patches are all cut on the fabric's straight grain, and that means you won't have to deal with the stretchy bias edges of triangles. Bonnie Scotsman is an excellent choice for beginning quilters. This version of the Bonnie Scotsman quilt block finishes at 10" square. You'll find two options for assembling the blocks—patch-by-patch or by strip piecing its components. Sewing one patch at a time is a good assembly choice for scrap quilts, but even strip-pieced quilt blocks can be constructed in a scrappy way. The instructions on page 3 explain how to strip piece 14 blocks. Increase yardage for additional blocks. Another way to create the quilt blocks is to use the method we associate with Disappearing Nine Patch quilt blocks. Sew one large block and cut it into quarters to make Disappearing Bonnie Scotsmen, a fat quarter friendly pattern. Scots on Point is a baby or toddler sized quilt that's constructed using the disappearing technique for this design. Choose any fabric colors that suit your needs. If you use stripes or other directional fabrics, consider how you want the prints to flow before cutting. Refer to the illustration, beginning at the middle row and moving left to right. Sew a rust print bar to a smaller black square as shown. Press seam allowance towards the black square. Sew the remaining rust bar along with a side of the large black square. Press seam allowance towards the large square. Join the two components you just created, aligning units as shown and matching edges and seam intersections. Press. Sew a 3" x 8" warm print to the right side of the new unit―the small black square should be at the new bar's top left. Press seam allowance towards the block center. Sew a small black square to one end of the remaining long, warm bar. Press seam allowance towards the black square. 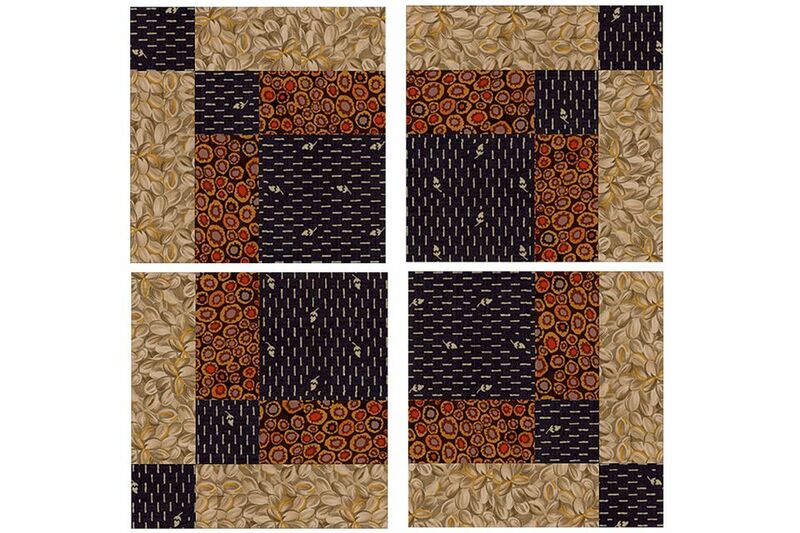 Sew this unit to the top of the quilt block, with the black square above the warm bar that you added first, as shown. Press the Bonnie Scotsman quilt block. The block should measure 10-1/2" x 10-1/2". Use this method to make 14 identical Bonnie Scotsman quilt blocks. Refer back to the block assembly diagram on page 2 for a reminder of the block's layout. Remember that directional fabrics, such as stripes, will not flow in the same direction when strip pieced segments are sewn into the quilt block. One segment of each strip set and the extra warm neutral bar shown are required for each block. Repeat instructions as needed for additional blocks. Cut (1) 3" wide black strip and (1) 8" wide warm neutral strip. Sew together lengthwise as shown. Press to set the seam ​(always) and then press the seam allowance towards the black strip. Square up one end of the strip set, creating a 90-degree edge. Starting at that edge, cut as many 3" segments from the strip set as possible (re-square up the edge as needed). You should be able to cut 14 segments. Cut (1) 3" wide black strip and (1) 5-1/2" wide rust strip. Sew together lengthwise as shown. Press seam allowance towards the black strip. Cut (1) 5-1/2" wide black strip and (1) 3" wide rust strip. Sew together lengthwise as shown. Square up one end of the strip set, creating a 90-degree edge. Starting at that edge, cut as many 5-1/2" segments from the strip set as possible (re-square up the edge as needed). You should be able to cut 7 segments. Cut another 5-1/2" wide black strip and another 3" wide rust strip. Create a second identical strip set and cut 7 more 5-1/2" segments. Cut (3) 3" wide strips from selvage to selvage. Square up one end of each strip and then cut (14) 8" segments. Refer to page 2 for a block assembly diagram. You have enough segments to make 14 Bonnie Scotsman quilt blocks. Each completed block should measure 10-1/2" x 10-1/2".